As a child, Ms Nicole Tan would help her mother bake cakes, but she developed a passion for baking only in recent years. The mother of a 22-year-old son and 21-year-old daughter says that because her children are grown up, she could pick up baking as a new hobby. It is also a way for her to achieve "work-life balance", says the 48-year-old director of conference services and catering at Grand Copthorne Waterfront Hotel. She took up a diploma in baking art and science at the Cereal Tech School of Baking Technology in 2016, going for four-hour classes three times a week after work. She shares her baking photos on Instagram(@traditionalbakes_nicoletan). She says: "I bake to keep my life balanced. My colleagues and friends get to eat the bakes too." 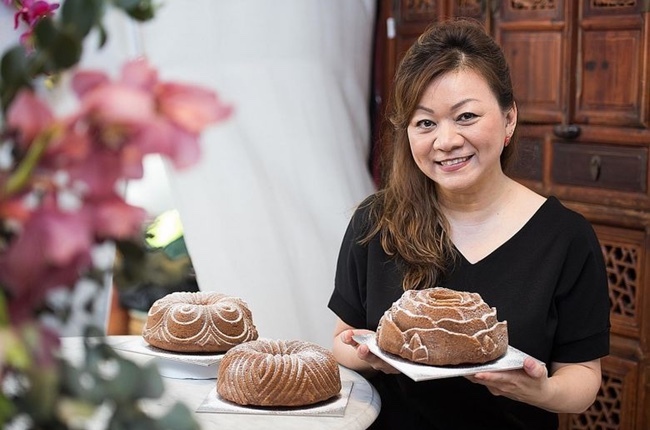 Her newfound love for baking is evident from the utensils scattered around her home, from old-school wooden mooncake moulds to kueh bangkit crimpers to kueh bahulu pans. Ms Tan is most proud of her Nordic Ware cake pans, which come in whimsical shapes. She shares her recipe for citrus limoncello cake, which she bakes in the bundt pans, although a normal 8-inch baking tin can also be used. Limoncello is an Italian lemon liqueur available on RedMart or at Duty Free Singapore in Changi Airport. The recipe yields a fragrant, buttery and moist cake. Ms Tan is planning to experiment on another version with Absolut Citron vodka, using the same basic pound cake recipe. For a non-alcoholic cake, the limoncello can be substituted with more orange essence. She has two large glass jars - one with orange peel soaked in rum and the other with mixed fruit soaked in rum and brandy. The second jar is from last Christmas, when she started baking fruit cakes at a friend's request. She also baked 26 fruit cakes that were sold for charity. She has plenty of other ingredients on hand should she feel like baking after work or on weekends. She says: "Normally, I have 10 salted and 10 unsalted blocks of butter in my refrigerator. And during Chinese New Year, I went through seven trays of eggs. "If I can't sleep, I'll bake till 3am and exchange pictures with my course mates." Other sweet treats in her repertoire include pineapple tarts - using a recipe from her late maternal grandmother - and sweet pandan buns filled with gula melaka and coconut. The gula melaka was bought in Malacca. Getting there involved sitting through a 13-hour traffic jam. She hopes her enthusiasm for baking encourages others to bake too. "There is still room for learning. We need to make time, not find time, and there is always something positive that one can gain from learning something new. Learning a new skill and gaining knowledge is only the beginning." 1. Preheat the oven to 170 deg C.
2. In an electric mixer with a paddle attachment, cream butter and sugar for three minutes till the mixture is pale yellow and light in texture. With a spatula, scrape the sides of the bowl and cream again for three minutes to make sure it is evenly mixed. 3. While creaming, add in one egg at a time. 4. Whisk the flour in. You should get an evenly mixed, creamy batter. 5. In a bowl, mix the lemon zest, marmalade, fresh milk, orange essence and limoncello. Pour the mixture into the batter and fold in with a spatula. 6. Thoroughly grease an 8-inch baking tin or bundt pan (10 cup capacity). Dust with flour. 7. Pour batter into the tin and bake for 40 to 45 minutes. Insert a toothpick into the centre of the cake to check that it is ready. It should come out mostly clean, with a few moist crumbs attached. 8. Remove the baking tin from the oven and place on a wire rack to cool. 9. When the cake has cooled to room temperature, carefully remove from the tin. Slice and serve. The cake can be kept in the refrigerator for one week.